My experience of Pride was surprisingly good yesterday. Of course I never approached the main stage or the dance tent or the cabaret or the fair ground. With my sensory issues it's hard to be there at all. I have to miss out on some of what is on offer. And I admit that I miss out on some of it by deliberate choice. I'd had a difficult morning. Much anxiety and tears and I wasn't going to attempt Pride at all. I was going to Durham - to give my soft toy a birthday adventure because I'm odd like that. But I decided we'd go and see if being part of the parade was possible. I had a look but it was too crowded and noisy and I wasn't coping. There was an opportunity though for the birthday toy to meet the mayor of Newcastle and to point out to a vegan that the flag she'd been handed was representing Nando's. Later I found myself watching the parade. That's a new experience for me. I've never watched it before. Keep together next year guys! Too many big gaps were forming. But about two thirds into the parade a friend from Spectrum Theatre - a group for autistic adults - spotted me and dragged me (I exaggerate) into the parade. So I paraded and wished I hadn't left my trans flag at home and had dressed more wildly for such an occasion. My soft toys paraded too of course and really enjoyed it. Because I'm odd like that. Everyone was fortunate. The weather forecast was for lots of rain but the parade was dry and much of the day remained dry too. I saw more trans flags being toted than I've seen before. And noticed more of other flags too - I hardly saw them at all other years. Bisexual, Asexual, Pansexual, Poly. It was good to see. Pride events can forget to be properly inclusive and sometimes they've been known to actively stand in the way of proper inclusion. These flags had nothing to do with the organisation of the event but each one clearly stated "We WILL be included. We are here and are not going away." I wasn't going to enter the actual event. I knew I'd want lunch and you're not allowed to take lunch with you. No more friendly picnics are possible at Pride unfortunately. I also knew it would be very noisy and that it's always hard work to be there. But I entered the event. Knowing there would be free pens inside. I hastily drank my bottle of tap water on the way in knowing that it would be binned otherwise. The signs say "No alcohol" can be brought in but I knew from last year that my tap water would be confiscated too. 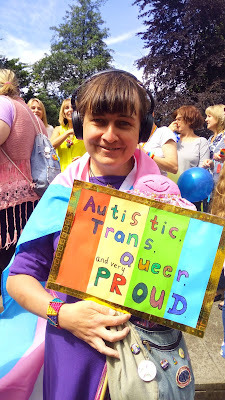 The worst thing I experienced was the stalls - from relevant LGBT+ groups, local friendly crafty people, and corporates and unions. It wasn't the stalls themselves that were bad. But the gap between the rows of stalls was just far too narrow. It can't have passed the minimum width for health and safety by much. It was really crowded and it was hard to move or to see everything and I got pretty overwhelmed with it. I know a lot of people found it difficult, including the stall holders. Northern Pride need to take a good look at this because it's just uncomfortable and it's not as if there's no space to spare to make it a much more comfortable experience for everyone. The most enjoyable thing for me was the youth and children's area and not being turned away from it by a grumpy security guard like happened a couple of years ago when I actually had a reason to be there. I knew that a woman who does lots of woodland and craft things was there this year so I went in and made a dream catcher with her. The main tent had lots of craft activities and also had a sensory area run by Sensory Spaces an excellent local charity working with autistic children. In that area I found friends who happened to be there. It was pleasant and relaxed. It was also at the point furthest from any of the different music going on around the site. It was also good to bump into lots of people I've met in different places over the past four years. Only one of those places, Northern Lights MCC is directly connected with queer issues. I'm fortunate to have found safety and acceptance in so many other places and to have found good people almost wherever I turn. I spent zero at Pride. One of the stalls had free bottles of water and I was able to finish off a cake at the Northern Regional Gender Dysphoria Service stall in the health zone. That was enough to get me through. Hoorah! I left the event just before five o'clock. Others may stay until midnight and then go and party the night away. But five o'clock is a record for me. By that time I'd had enough and I was wandering round the health zone in a "Clare has quite an obvious learning disability" kind of way that happens when my brain has really had enough. I have an IQ above 150 and have many coping strategies. But sometimes autism becomes very, very obvious. That was my Pride. I'd thought about going to a Pride service with the Unitarians this morning but they had to cancel unavoidably. I'm glad the local Anglican Cathedral offers a Pride service too and that it isn't the only church in the city centre to hang rainbows. I don't think I can make the vigil service tonight run by MCC. That's a shame. The picture by the way is from last year. If I'd known I'd be parading again this year in dry weather I'd have taken my placard again. And left everyone wondering what the hell those flag colours might represent.